A letter informing Mrs. Henry that Mr. Simonds and Mrs. Siccardi's donations were received. 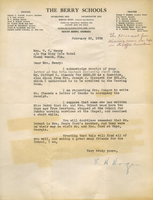 Hoge also mentions that Mrs. Henry Ford's brother Mr. Bryant visited on his way to see the Fords in Way, Georgia. 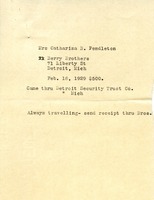 Note was not addressed and only provides the donor's name and instructions for sending a receipt.